For some brides, finding the gown is all they’ve dreamed of doing since even before getting engaged. For others – the thought of having to try on dozens of gowns is somewhat daunting. If you’re engaged and have found yourself delaying the wedding dress shop experience – fear not… We’ve put together a little guide to help make the process a little easier and far less daunting for you. When it comes to finding the gown, not all brides have the same feelings towards the process. Some have been dreaming about their gown since being a little girl, others may dread the experience entirely. Finding the gown need not be something to dread. Nor does it need to be a scene from a Hollywood chick flick or reality show. It’s a process that for some comes more naturally than others but for all brides-to-be it requires patience and rationality. Firstly, we recommend having a little browse to find some inspiration. This doesn’t mean compiling a portfolio of magazine cut-outs or creating a mood board (however please feel free to do this if it’s what floats your boat). The beauty of being a bride in the 21st century is that there is endless inspiration at your fingertips. Whether it’s Instagram, Pinterest, Wedding Blogs or magazines – inspiration is everywhere. That being said, even if you fall head over heels in love with a gown on the internet the most important thing is to keep an open mind. How a dress looks in a photo can be drastically different in real life. So it’s important to not set your expectations too high and let your inspiration be a gentle guide. Another thing to consider before booking an appointment in a bridal shop is to consider your budget. It’s always good to have an idea of what you would like to spend so that you don’t fall in love with something that you would never end up purchasing. Wedding gowns vary greatly in cost, so do some research into the shops you plan on visiting. No one will judge you for asking prices or voicing your budget. If anything, it will only improve your experience and your consultant will be greatly appreciative. Ok, you’ve done a little research into wedding dresses and bridal shops – time to book the appointment! Here at Browns Bride you can book an appointment by calling us directly or by filling in our online form. Most bridal shops will charge a consultation fee but please note the consultation fee we charge here at Browns Bride is refundable if you were to purchase a gown! Another question we get asked a lot is “How many people can I bring with me to my appointment?”. The answer to this question is entirely dependent on who you are as a person. There is no right or wrong answer. However, we tend to find brides are most comfortable when there is no more than 3 guests. Too many opinions can be overwhelming and the ultimate thing to consider when buying a gown is what you want to wear. During your first couple of appointments we recommend that a bride tries on a mixture of silhouettes so she can truly harness her own style. Your wedding dress should reflect who you are. So for example, if it’s unlike you to wear anything low-cut and revealing then we would probably advise against that deep plunging neckline. The more comfortable you feel – the better you’ll look on the day. The amount of shops you visit is also entirely personal. 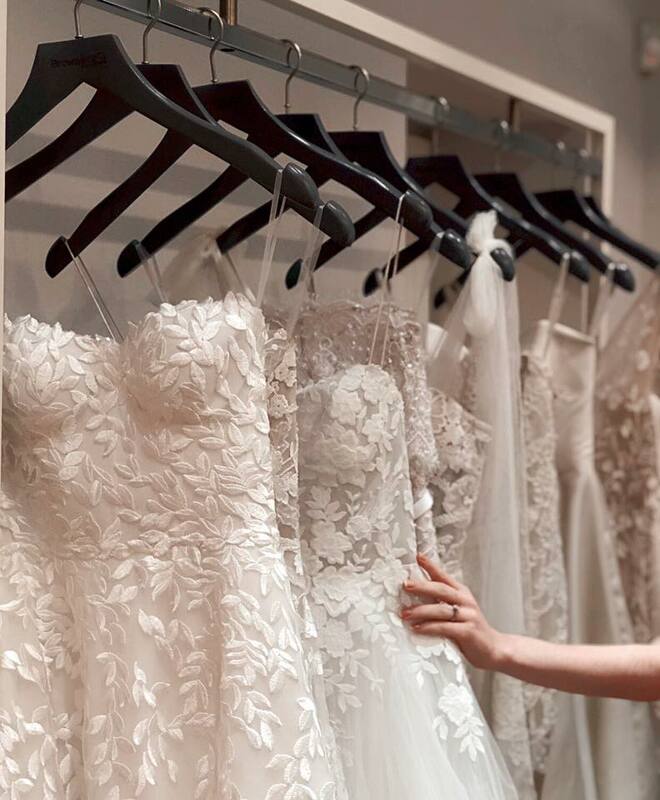 A bride might have planned to go to every single bridal shop in the city – but could end up finding her gown after the second shop. Every bride will reach a limit as to how much wedding dress exposure she can handle. Once you feel you have seen enough gowns, it’s good to shortlist your favourites and revisit them. Trying a gown for the second time can be a totally different experience. How do you know that you’ve found “The One”? Well, firstly – it’s a feeling you can’t fake and no – you don’t have to cry. You’ll put the gown on and (whether it’s for the first time or if you’re retrying it on for the eighth time) you’ll just know. You won’t want to try another gown after it. When you have officially “said yes to the dress” your consultant will handle the rest and for you the hard part is over. The most important aspect to consider in regards to time frame is how long the gown will take to order. Most wedding dresses require 6 months order time. On top of this you will also need to allow 4-8 weeks for those all-important fittings. In summary, we find that brides who start looking for their gown 9-12 months in advance have the most ideal (and least stressful) time-frame! Stay tuned for Browns Bride Dress Guide Part 2. where we talk all about the Fittings process!